Now you can reach those annoying hornet nests, wasp nests, and yellow jacket nests high in the rafters and under the eaves. No need to use a ladder. Dramatically reduce the number of flies, wasps, yellow jackets and hornets. Virtually eliminate the over-spray blowing back into your face and eyes. Don't get overspray all over the feed, water buckets, and hay. With the Gotcha Sprayer you can position the wasp and hornet spray directly in front of the hornet's nest and saturate the nest with one quick blast, minimizing the amount of spray drift. 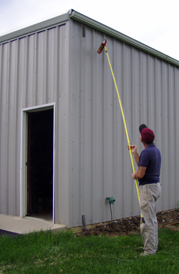 The Gotcha Sprayer can also be used with aerosol flying insect sprays. 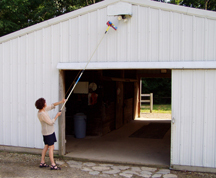 Use the Gotcha Sprayer to spray the flies up in the rafters. Some wasp and hornet sprays contain precautionary statements warning that the spray is harmful to domestic animals, toxic to fish, and shouldn't be applied directly to water. It pays for itself over and over again by providing safety, reducing the amount of spray used and significantly reducing the amount of time needed to spray the nests.